Danny Redden was just putting his cleats into his locker when he looked up and saw his teammate — and best friend — Max. “I was just about to take a shower,” said Danny, who was hot and sweaty from practice. So Danny shoved his feet into his sneakers and headed for the office. He was a decent student, so it wasn’t his grades. Though, to be honest, he’d been letting things slide a little, especially that last math test — ouch. But this was the first time the baseball team had been in contention for the state championship in 11 years and as the star pitcher, Danny had helped take them there. Surely everyone would cut him a little slack. And besides, since when did the principal call you in over a botched test? Taking a big breath, he knocked tentatively on the closed door and then stepped inside. There was the principal, Mr. Irving, at his desk. Across from him sat coach Geller and behind him stood assistant coach Benson. And when he’d taken an empty seat, he saw his mother; she had been hidden by the open door. Uh, oh. If his mom was here, he must really be in trouble. “Sit down, Danny,” said the principal. Danny did as he was told. The principal did not look angry. But then again, you never knew. “Why not?” he croaked. The series was tied, 2-2. The last game would be played this coming Saturday, and coach Geller was counting on him. “Coach Benson accidentally left your name off the roster, and the rules state that every player has to be listed in order to participate,” said Mr. Irving. “Can’t you just add my name?” Danny asked. Danny didn’t know what to say, so he looked at coach Geller, who was shaking his head sadly. Coach Benson was staring at the rug, and Danny’s mom seemed ready to cry. Danny knew just how she felt. “Let me try,” said Danny’s mother. Ever since his dad had taken off, it had been just the two of them. And she was always there for him, always in his corner. Danny and his mother walked out of the principal’s office together. “We’re going to fight this,” she said. The next day, while his mom was busy calling or emailing every single member of the committee, Danny went to school and, later, to practice. Coach Benson wasn’t there, and he was glad he didn’t have to see him. This was all his fault. But coach Benson had been really good to him, especially when he had been new to the team. He also knew that the coach’s little boy was very sick and needed an operation. Maybe that was why he’d overlooked putting Danny’s name on the roster; he had other things on his mind. When he got home from school, Danny didn’t even have to ask whether his mother had been successful in her attempt to sway the minds of the committee members. Her expression said it all. To Danny’s surprise, he fell asleep easily that night. 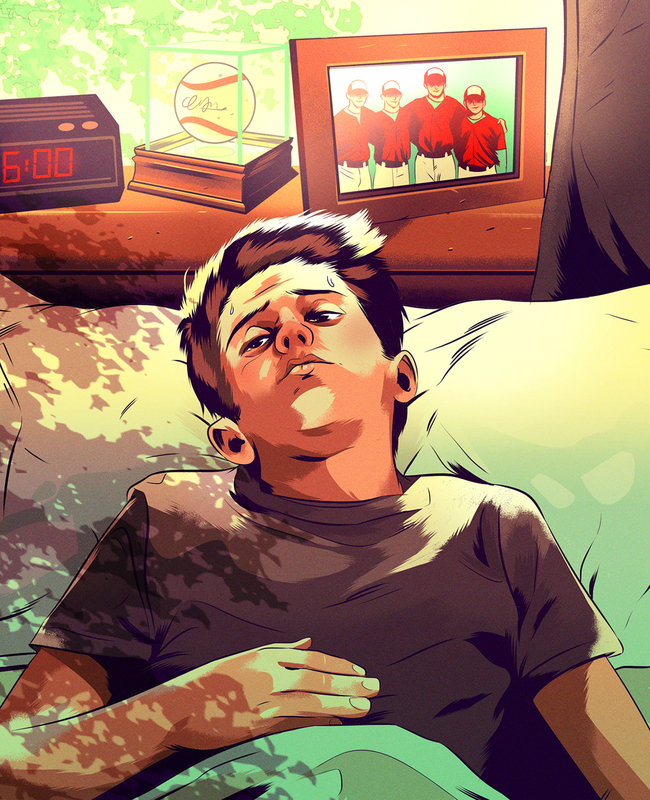 He dreamed he was on the mound, striking out batter after batter. But when he woke up, the disappointment kicked in again. The next day was the state championship game. His team would be competing for its most important win in years — and he wasn’t going to be a part of it. There was no practice that day. Coach Geller wanted the players to rest up. “Even though you’re not playing, I hope you’ll come with us anyway,” he said to Danny. Danny just made some noncommittal noise; he wasn’t sure he wanted to be there. Later on, Danny asked his mother what to do. All night long, Danny’s mind felt like a tennis ball smacked from one side of the net to the other. Should he or shouldn’t he? Should he or shouldn’t he? He was exhausted the next morning, but at least he’d come to a decision: The team was still the team. And he was a team player. He belonged there today, and he wasn’t letting some dumb clerical error keep him away. His mom had left for work, so he washed his uniform himself and ironed it too. And then went to school, where the bus would be leaving for the game. Coach Geller was glad to see him. So were coach Benson and all Danny’s friends. On the ride, the boys were rowdy and goofed around. Danny knew it was to hide their nervousness. Finally, the bus arrived. Danny sat in the bleachers as the game got underway. He cheered himself hoarse when his friend Max hit a home run; he groaned when Chad Myers bobbled a ball in the outfield. First his team was ahead, then the other team caught up. Finally, in the bottom of the ninth, Simon Garth knocked one out of the park, scoring the winning run. Danny exploded out of his seat. He couldn’t wait to get down to the field to celebrate the moment with his team. They had won! All the boys were laughing, and giving each other fist bumps and high-fives. That night, his mother was quiet as he told the story. His mother looked at him almost like she’d never seen him before. Then she smiled and hugged him tightly. Great story! I loved when Simon Garth hit a home run.